Do you have a lot of misstrokes? My little fingers on both hands are nearly two inches shorter than my ring fingers. That caused my ring fingers to drag, resulting in misstrokes and shadowing. After theory, writing cleanly helped, but I needed consistent, specific practice to strengthen my ring and pinky fingers and develop better coordination. Then I learned about finger drills and exercises and bought a manual. After a few weeks of practice, I was hitting the right keys with fewer misstrokes. To develop accuracy, do the drills every day: while warming up before class; between classes; and especially during practice at night before bed. Diligent practice prevents or stops shadowing, finger-drags and misstrokes. These exercises can be boring, but if you dedicate 30 minutes each day focused entirely on this practice, without distraction, within a short time you will experience improvement in your writing ability. Almost miraculously, those strokes you could not get before will become easier. If you play the piano or other instrument, fantastic! 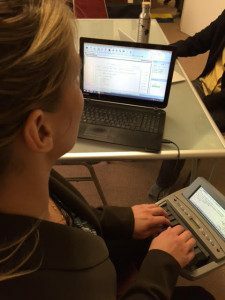 Learning how to play an instrument requires discipline, and your coordination and muscle memory development will help you master your steno writer. Have fun playing music while you exercise your fingers. 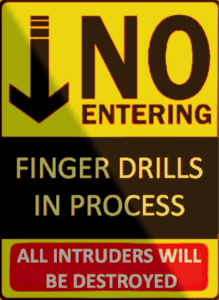 AND do finger drills. Golden Rule #3: Finger Drills & Exercises is an excerpt from Part 2 of my e-book, 0-225: Your Guide to Writing Mastery (October 2015).